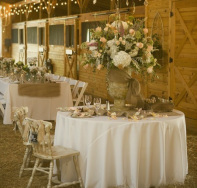 Tucalota Creek Ranch is the perfect venue for your wedding, horse show, or outdoor event. Here you will find out more about the types of events that happen at TCR and how to contact someone to answer your questions about hosting your next event with us. To get the latest news on what's happening around the Ranch, visit our updates page. We would like to take this opportunity to introduce you to Once Upon A Wedding, a full service catering company who believes in making their clients wedding day or event a lasting memory with the utmost satisfaction. Twenty-five (25) years of experience has given them the tools to make their clients happy. Their off-premise catering operation was established in Orange County, California in 1979 as American Classic Catering. 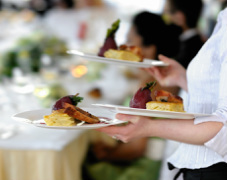 Seeing a need for high quality catering services in Riverside County, they made their move in 1986. they made the move and have never looked back. Since then, they have successfully completed events from backstage parties with Oingo Boingo and Chicago to donating their services for Governor Wilson at the Winchester fires in 1992. Once Upon a Wedding can help you coordinate Florists, photographers, disc jockeys, cakes, and bands, which are all listed on their website. These companies and individuals provide exceptional services and we highly recommend them to you for your special day. Once Upon A Wedding can promise you a day that you have always dreamed of and will never forget. Please take a few moments to check out all areas of their website, it will definitely be helpful to you.